Two of the Temptations of Jesus in the Desert by Satan and Jesus served by the Angels, Maitre François, 1475, miniature, from St Augustine’s “La Cité de Dieu”; manuscript MMW 10 A 11; Koninklijke Bibliotheek, The Hague. Bishop Robert Barron on “Three Questions from the Desert“. Bible Scholar, Dr John Bergsma, on “The Temptations of Jesus“. 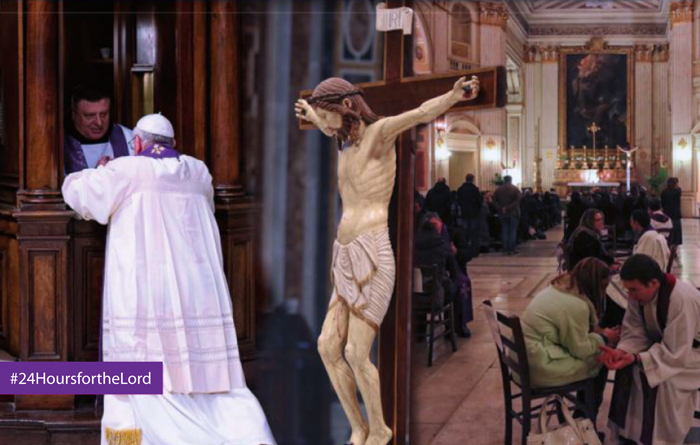 Bible Scholar, Dr Brant Pitre, on the readings for the First Sunday of Lent. In other news, on Friday, 12 February, Pope Francis and Patriarch Kirill of Russia met in Cuba. This is the first time the head of the Catholic Church has met the head of the Russian Orthodox Church since the Great Schism of 1054! Pope Francis and Patriarch Kirill have issued a Joint Declaration. Read and observe how the Holy Spirit is working in the Church today. Categories: Parish Newsletters and Readings, Uncategorized | Tags: 1st Sunday, First Sunday, Jesus, Lent, Mass readings, Patriarch Kirill, Perth, Pope Francis, Temptation in the desert, Year C | Permalink. All Saints Day | We celebrate the Eve of All Hallows! 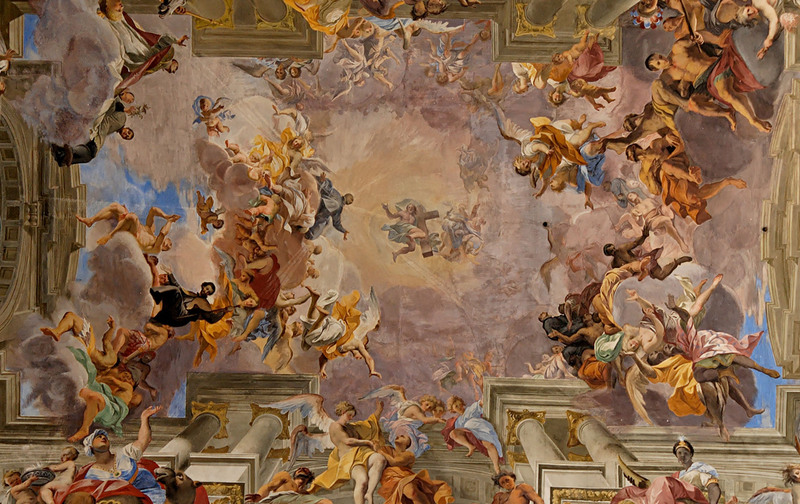 St Ignatius Loyola being welcomed into heaven by Christ, detail of nave ceiling fresco by Andrea Pozzo, c. 1685, Chiesa di Sant’Ignazio di Loyola in Campo Marzio, Rome. Join us for our Halloween supper after Mass tonight! Some Christians have a problem celebrating Halloween, thinking it gives too much glory to Satan, death and evil itself. Actually Halloween was originally a celebration leading up to the greater feast of All Saints or All Hallows (1 November), the purpose of which is to celebrate those Saints who are with Christ in glory because of his victory over sin, death and the devil. There is a lot that is unsavory about the contemporary celebration of Halloween. What does the singular focus on violence, horror and death have to say about our culture? The traditional, Catholic Halloween placed these realities within the context of Christ’s victory over sin, death and the devil. The current secularized version of the festival has no salvific content and has been loosed from its theological moorings. It looks very much like a festival of death for a culture of death and for that reason I can see why parents might be concerned. But what is the proper response to a culture of death? To lock the Church behind closed doors or to let her out into the world? I think it is time for Catholics to accept the religious liberties that this culture claims to afford them and go public with their own festivals- and to do so dramatically and with a great deal of public fervor. What is holding us back? What are we afraid will happen? The reticence and fear that characterizes Catholics is costing the Church its unique culture and it is allowing the culture of death to flourish. Halloween should not be a day when our churches go dark and Christians retreat into the shadows, but when we fill the darkness with Christ’s light and go out into the culture, inviting everyone to the prepare for the festival of the Saints with all the joy we can muster. For a great scripture study on today’s readings, try The Sacred Page. And listen to Bishop Robert Barron’s homily, What Does it Mean to be a Saint? Categories: Parish Newsletters and Readings | Tags: All Hallows, All Saints, Halloween, Mass readings | Permalink. Solemnity of The Body and Blood of Christ, Year B | Why do I remain Catholic? The recent Pew Forum’s study on America’s Changing Religious Landscape has sparked a flurry of statements from good people on why they remain Catholic, and Elizabeth Scalia at The Anchoress has asked for contributions from committed Catholics everywhere. We are not American, but Australia suffers from the same problem as America, with the number of Christians expected to drop from 67.3% in 2010 to 47.0% in 2050. Today’s solemnity gives us an opportunity to talk about one of the chief reasons I remain Catholic: in the Catholic church we still remain faithful and obedient to a particular instruction from the Lord about what we need to do to inherit eternal life. Of course, there are many things that are required: following his commandments, accepting him as our Lord and Saviour, but we can’t ignore this one: eating his body and blood, which is what today’s solemnity is all about. When Jesus says, “οὐκ ἔχετε ζωὴν ἐν ἑαυτοῖς” (you have no life in you), the word ζωὴν or “Zoe” refers not to physical life, but to spiritual life – the eternal life of the soul. The early church certainly understood the Sacrament as literally Christ’s Body, Blood, Soul and Divinity. Ignatius of Antioch, Epistle to the Philadelphians, 3:2-4:1, 110 A.D.
Take care, then who belong to God and to Jesus Christ – they are with the bishop. And those who repent and come to the unity of the Church – they too shall be of God, and will be living according to Jesus Christ. Do not err, my brethren: if anyone follow a schismatic, he will not inherit the Kingdom of God. If any man walk about with strange doctrine, he cannot lie down with the passion. 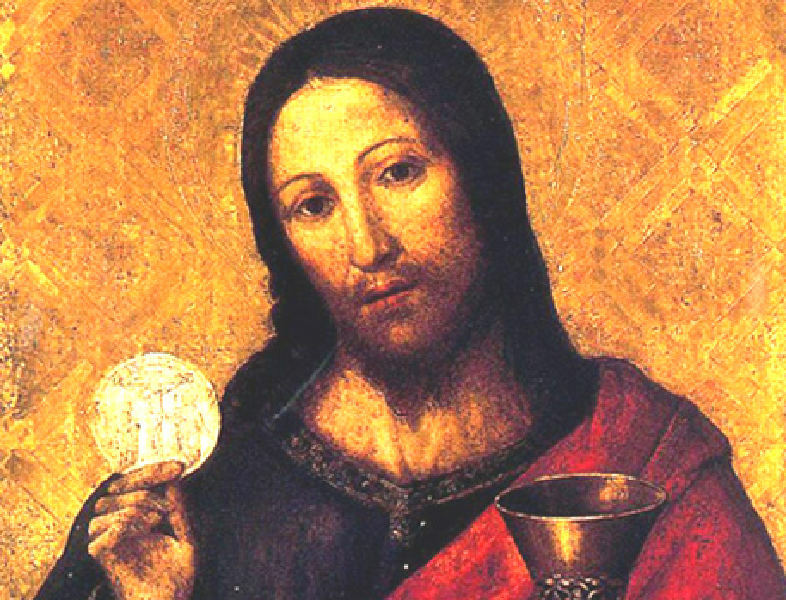 Take care, then, to use one Eucharist, so that whatever you do, you do according to God: for there is one Flesh of our Lord Jesus Christ, and one cup in the union of His Blood; one altar, as there is one bishop with the presbytery and my fellow servants, the deacons. “’Eat my flesh,’ [Jesus] says, ‘and drink my blood.’ The Lord supplies us with these intimate nutrients, he delivers over his flesh and pours out his blood, and nothing is lacking for the growth of his children”. … and these are just a few references from the 2nd century. Many more are found among the Church Fathers. Anyway, I do recommend you go and read these beautiful testimonies. Categories: Parish Newsletters and Readings | Tags: australia, Church Fathers, Corpus Christi, Jesus Christ, Living Bread, Mass readings, the Body an Blood of Christ, The Eucharist, The Lord's Supper | Permalink. Pentecost Sunday | Come, Holy Spirit, and help us! Pentecost, El Greco, c. 1600, Museo Nacional del Prado, Madrid, oil on canvas. If the “fruit of the Spirit” is love, joy, peace, patience, kindness, goodness, trustfulness, gentleness and self-control (Gal. 5), then today the Holy Spirit has been showing me how poor I am in fruits! Our washing machine has been playing up the whole week, and finally I decided to get a new one. (This was after a week when I had already forked out $600 repairing the damage to our house caused by cockatoos. They had pecked a hole the size of a dinner plate into our western red cedar.) Anyway, when I went to collect the washing machine today (a two hour drive, as I had to borrow a larger car), I found the invoice I had been given the previous day was for someone else’s goods, which involved a trip to customer service to sort it out. At this stage I was still patient and forbearing. Anyway, the correct goods were eventually found and the new machine was brought home, but the brand new hoses wouldn’t attach without leaking! I tried various manoeuvres with washers, but eventually resigned myself to the fact that our taps were way too corroded and this was making it impossible to get a good seal. (Handy hint: old taps glued with large amounts of lime-scale prevent leaks!) So it was another hour’s trip to the hardware store to buy a new tap set. And, yes! This worked! The Widow Fleming strikes again! So I put on a load of washing, got the music ready for church, and made dinner. I was still congratulating myself on my patience and perseverance at this point, and we set off for the Pentecost Vigil. But at church, several things happened which annoyed me to bits. I won’t give the details, as we should be trying to build one another up in the Lord, and stirring up discord within a church community is one of Satan’s wiliest tricks. Still, I kept smiling. Back at home, it was finally time to relax and unwind, but not before we had hung out that first load of washing from the new machine. My son volunteered, but being the multi-tasking character that he is, decided he would save himself two trips and carry both the washing basket and his plate, which was loaded up with roast pork, vegetables and a rather wonderful gravy. Well, somehow the plate tipped over, spilling the wonderful gravy, peas and greasy pork all over our clean washing. And it was at this point that I completely lost it and managed both to shout at him and burst into tears at the same time. So much for patience, self-control, gentleness and the rest. Holy Spirit, I’m obviously not there yet. Please take over! I need more of you! And while You’re at it, please help our Pastoral Area as well – we need your grace in order to grow. Of course, all my little difficulties are first world problems, and the best way of coping with them is to laugh at them. Fr Longenecker has the right idea in his article on Hilarity and Holiness. John Bergsma does an excellent job on the readings here and here. And Fr Barron has an interesting take on Pentecost in this homily for today. Categories: Parish Newsletters and Readings | Tags: Holy Spirit, Mass readings, Pentecost, Vigil Mass, Year B | Permalink. a page from the Gospel Lectionary portion of the Bamberg Apocalypse, 11th century Staatsbibliothek, MS A. II. 42, Bamberg, Germany. The key to understanding both the meaning and significance of this feast is a recovery of the Jewish sense of heaven and earth. In regard to “heaven” and “earth,” most of us are, whether we know it or not, Greek in our thought patterns. By this I meant that we tend to set up—in the manner of the ancient Greek philosophers—a rather sharp dichotomy between the material and the spiritual, between the realm of appearance and the realm of true reality, between the fleeting earth and the permanent heaven. And if we’re spiritually minded, we tend to think of salvation as an escape from this world—this vale of tears—to a disembodied state called “heaven.” The problem is that these convictions have far more to do with Plato than with the Bible. Biblical cosmology is not fundamentally dualistic. It speaks indeed of “heaven” and “earth,” but it sees these two realms as interacting and interpenetrating fields of force. Heaven, the arena of God and the angels, touches upon and calls out to earth, the arena of humans, animals, plants, and planets. On the Biblical reading, salvation, therefore, is a matter of the meeting of heaven and earth, so that God might reign as thoroughly here below as he does on high. Jesus’ great prayer, which is constantly on the lips of Christians, is distinctively Jewish in inspiration: “Thy kingdom come, thy will be done, on earth as it is in heaven.” Notice please that this is decidedly not a prayer that we might escape from the earth, but rather that earth and heaven might come together. The Lord’s prayer recapitulates and raises to a new level precisely what the prophet Isaiah anticipated: “the knowledge of the Lord will fill the earth, as the water covers the sea.” Continue reading here. Listen to the homily for today here. 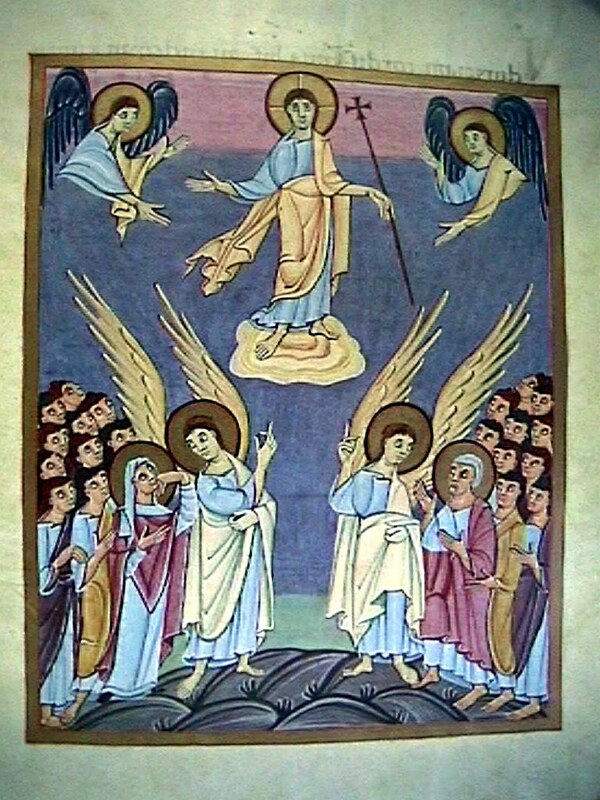 Categories: Parish Newsletters and Readings | Tags: Ascension, australia, Bamberg Apocalypse, Biblical cosmology, heaven, Jesus, Mass readings, Sunday Readings, Year B | Permalink. 6th Sunday of Easter | Is God using you to advance his plan? 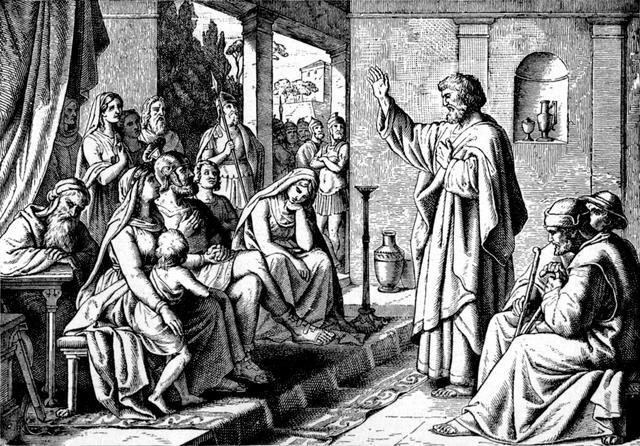 Peter in the house of Cornelius, 19th century, woodcut, artist unknown. 1. He intervenes dramatically in Cornelius’s life by sending an angel to ask him to fetch the Apostle Peter from Joppa (a distance of about 50 km). Notice that Cornelius is obedient. He doesn’t suspect he’s having hallucinations and douse himself with anti-psychotics. No, he sends a ‘devout soldier’ and two of his servants straight off to Joppa to carry out God’s wishes. We can’t comprehend how shocking this must have been to Peter. Orthodox Jews take very seriously God’s instructions about food – the dietary laws of Leviticus and Deuteronomy, revealed to them under the Old Covenant (the Jewish Kashrut or כַּשְׁרוּת). In fact, for Peter to take God seriously, God has to give him the same vision three times. It is the conjunction of these two key events that lead to the conversion of the Gentiles. 17 While Peter was wondering about the meaning of the vision, the men sent by Cornelius found out where Simon’s house was and stopped at the gate. 18 They called out, asking if Simon who was known as Peter was staying there. 19 While Peter was still thinking about the vision, the Spirit said to him, “Simon, three men are looking for you. 20 So get up and go downstairs. Do not hesitate to go with them, for I have sent them.” 21 Peter went down and said to the men, “I’m the one you’re looking for. Why have you come?” 22 The men replied, “We have come from Cornelius the centurion. He is a righteous and God-fearing man, who is respected by all the Jewish people. A holy angel told him to ask you to come to his house so that he could hear what you have to say.” 23 Then Peter invited the men into the house to be his guests. Tell him you are open to Him, that you want him to teach you, that you want to unite yourself with His will. Like Cornelius, spend time in prayer every day, talking to God as if he is your best friend, and spending at least as much time in silence, letting God fill your heart and soul with His thoughts. Like Cornelius, avoid hypocrisy, by being generous to those in need. Listen to the voice of our Papa, Pope Francis, the steward whom Jesus has placed over his earthly flock. For more thoughts on today’s readings listen here to how God chooses you. Categories: Parish Newsletters and Readings | Tags: 6th sunday, Acts 10, Apostle Peter, Cornelius, Cornelius the Centurion, Easter, God's plan for you, Kashrut, Mass readings, Peter the first Pope, Year B | Permalink. Are The Ten Commandments still relevant for us? I have friends who claim the Bible is nothing special – just a man-made unenlightened compilation of Bronze Age writings, and certainly not inspired by the Holy Spirit. If that were the case, Jesus would not fulfil so many prophecies from the Old Testament. In today’s Gospel, for example, we see Jesus fulfilling prophecies from Isaiah 56:6-7, Jeremiah 7:1-11 and Malachi 3:1-3, to name only a few. John Bergsma gives a great analysis of the readings here. By the way, these lists of sins are not exhaustive – they are just meant as a guide. If you take time to examine yourself and listen to the Holy Spirit, you’ll find many imperfections that aren’t even on the list. Joondalup Holy Spirit Chapel: Adoration and Confession from 00h00 (midnight) Friday until midnight Saturday. Mass: 12:10 Friday. Please put your name on the adoration roster in the front porch. Our Lady of the Mission, Whitfords: Exposition of the Blessed Sacrament: Friday 09.30 a.m. to 7.00 p.m., Mass Friday 9 a.m, Saturday 08.30. Confession: Saturday 12.00 to 13:00and 17:30 – 18:00. St Simon Peter, Ocean Reef: Blessed Sacrament Adoration Friday 9:00 to 18:50. Mass: Friday 19:00, Saturday 8:30, Reconciliation: Friday 18:30-18:50, Saturday 17:00-17:45. St Andrew’s, Clarkson: Mass: Friday and Saturday 08:00, Reconciliation: Saturday 17:00 to 17:30, Exposition of the Blessed Sacrament and Benediction: Friday 15:00 to 17:00. Wishing you joy and grace this Lent! Categories: Parish Newsletters and Readings | Tags: 24 hours for the Lord, 3rd Sunday, Adoration, Confession, Examination of Conscience, Holy Spirit, Jesus, Lent, Mass readings, Northern Suburbs, Penance, Perth, Pope Francis, Reconciliation, Sunday Readings, Western Australia, Year B | Permalink.